Smithtown Kickers Barrage Long Island N.Y. Welcome to the homepage of the Barrage! The Barrage was formed as a intramural tournament team when the players were only 8 yrs old. The team went on to play travel soccer at U10-U19 winning 5 division championships during its years in LIJSL. 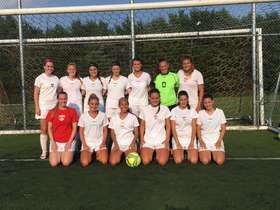 The team finished in first place in its final two seasons in Division 1 at U17 and U19. 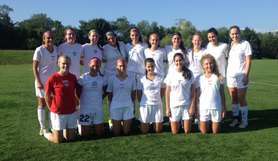 During its final LIJSL season at U19 it won the Walbaums Cup , Division Championship and finished as semifinalists in the NY State Cup. Today the Barrage is a U23 Adult team representing some of the best colleges in our area. The Barrage has won numerous adult competitions over the last few years. 2007 Pelini Tournament Champions , 2008 LIWSL League Champions, 2009 Marion Ring Tournament Champions...etc. Have fun at our site. Go Barrage! Dont forget to sign our guestbook!! Great season ladies. I wish you all the best of luck in your upcomming fall soccer ( and school ) seasons! I miss you all already so, keep in touch. Hope to coach you all again next summer. Bring teamates to the team next summer. Lets close out the summer of 2018 with a championship ! Barrage secures final 4 status! Barrage secures Champions Division Playoff Birth! Great job ladies! For the second year in a row we have secured a Champions League playoff spot! Final 4!!! Lets win it this year! NY Barrage fields for the summer of 2018! Welcome new players and best of luck to our graduation class! Practice schedule is posted..but locations may change due to field conflicts of camps/ tryouts etc. NY Barrage vs RVC in semifinals of LIWSL top division. Great start of the 2017 ( 11th year) NY Barrage! Nice game by all last nite. NY Barrage plays strong opponent Elite Level team at Allen Park. Our eleventh season begins June 4th. We have 7-8 regular season games and potentially a semi final and final game. The game schedule is not yet posted .. I plan to have two practices per week usually tues and wed nites tdb location. Games are sunday nites in june and july after 6 pm. I will also add the practice schedule and game locations/directions once available. NY Barrage 2016... are you in?? Once again , we will be fielding the NY Barrage in the LIWSL. For over 9 years we have competed with the best college teams on long island. Our roster size is limited to 26 players. This year we have many returning players that are dedicated to our training and team objectives. I really want to complete our registration process early this year. Uniform orders need to go in soon. NY Barrage 2015 on a roll. Barrage Summer 2015 about to begin! The Summer 2015 Season begins next week. No schedule has been posted by LIWSL tho. I plan to hold our first practice Friday May 29th at 6 pm at Stony Brook Road fields ( same as last year). Got a very late start ordering uniforms.. i will not have our new nike whites in for our new players. I hope to have our red alternate t shirts by then. Just to be safe, wear any all white short and all white socks to the game. IMPORTANT!! Our First Game will be at Westbrook Fields East Islip!!! 6 pm start 5 pm warmup! NY Barrage fields again for 2015...are you in? The NY Barrage will field again this summer. The team once again will form to provide college level training and games for high school seniors committed to playing in college and current/past college players. The season is in June and July . We play in the LIWSL www.liwomensoccer.com . League games are Sundays after 630pm. Playoffs can be on saturdays and sundays. I will again offer 1-2 practices min per week for those that want to train. Our home games will be again at the turf fields in smithtown, training will be either at smithtown, stonybrook plot or possibly other locations tdb. Fees are 50$ registration , 20$ bond, 100$ coaching/training fee, 70$ for the uniform ( new players). Ref fees will be 3-4$ per game collected at each game. NY Barrage plays in SemiFinals of 2014 LIWSL Champions league! The NY Barrage continues its success as one of the top teams in LIWSL. We will play in the Champions League Semi Finals tonite.. July 20th at 630 PM at Centereach Turf Fields.. ( see locations for directions). Last season ( 2013) we won the Europa League Championship. This season we finished tied with the United for 3rd place, with the head to head tie breaker forcing us to play the first place seed tonite. During league play, the NY Barrage defeated both the Bayport ( 1st seed ) and the RVC ( 2nd seed) teams. See you tonite at the game! NY Barrage welcomes 10 new teammates! Off to an exciting season. The NY Barrage welcomes 10 new teammates. We look forward to many exciting seasons to come. Barrage wins Europa League Championship in Overtime! 2013 Champions! The NY Barrage defeated the Levittown Shamrocks in overtime in the Europa League final July 21st. With only 9 players , Mallory, Kelsey, Carolanne, Sam, Nicole, Erin Beach, Erin Froelich , Tori and Allison we were able to win in OT. Outstanding effort that I appreciate. You all proved to be the most committed players I have. This victory advances the NY Barrage to the Europa Division Championship game next Sunday July 21st at Diamond in the Pines at 7pm . Take exit 63 North Ocean Avenue (CR 83). Make a left onto N. Ocean Avenue heading north. (This road will eventually become Patchogue-Mt. Sinai Road). Continue north crossing 6 intersections until you come to the intersection of Rt. 112. (Hawkins Road is the 6th and 112 is immediately next). Make a left onto Rt. 112. Park is immediately on your right hand side. The way the LIWSL schedule is layed out still allows us to make the playoffs. Regardless of the outcome of this sunday ( june 30th) game, we will play in the 1st round playoff game on sunday july 7th. If we win on the 7th , we will play in the quarterfinals of the champions league on july 14th. If we lose on the 7th, we will play in the Europa League semis on July 14th. WE NEED attendence to be better ! if you all show up...we can win this thing! Please make every attempt to be at our next games!! Great start to the season ( NY Barrage 4, LI Lightning 1). Great game NY Barrage! Our next game is this sunday 6/9/13 630 pm at Stony Brook P-Lot field 8. Please arrive at 530 for a good warmup. Wear White, bring Red Jerseys. NY Barrage Summer 2013 starts June 2nd! Game 1! We play our first game this sunday at 6 pm at the Medford Athletic Complex. Please arrive at 5 pm to properly warm up and for the newest players to get thier uniforms. Always wear white socks, and bring 5 dollars for the ref fee. We dont have a lot of players on our roster so its important that you all committ to showing up. We can still add to our roster..so please let me know if you have any friends that would like to play. Practice schedule will be posted on this site as well as games and directions..
As soon as i get the game schedule, i will post all the games and directions..
see (Locations) for directions to fields. NY Barrage 2013 , are you in? REGISTRATION INFO need asap! The NY Barrage womens college summer league team will be fielding for its 8th season! We are rounding up our roster now. The season starts Sunday June 2nd and runs till the end of July 2013. The offering of training 2x per week and 1 league game Sunday eves is the same. 516 818 7597 for more info.. Once I have accepted you to the team you need to do the following asap. The mission of the team is to provide current college players the opportunity to get/stay fit during the summer months with two , college level training sessions per week and a competitive college level game per week. Ex college players that still have the desire to play at high levels are also invited. The training is offered to all that roster. The Practices will be at Stony Brook P lot.. Home games at Stony Brook or Smithtown Locations. Barrage fields again for Summer of 2012! Hi Barrage! Hope you all had a great year! We will again field our summer team this June and July in the LIWSL. We have our first administrative meeting this week. First on the agenda is to round up returning players and recruit new players. We are again offering a womens program intended to provide high quality training to HS Seniors and College players that want to make sure they are game fit for their fall pre Season tryouts and camps. We will again offer two trainings per week to those players that desire to train. We will play League games on Sundays and if we have enough interest, we will play in the Marion Cup tournament that plays on select Saturdays. The season starts in June, and concludes the end of July. Please contact me at coachjoe@optonline if you intend to play. Have any teammates / interested friends contact me as well. Registration starts soon, so i will need to finalize a roster soon. No Game Today.. Barrage wins Europa League Championship 2011! Our season is concluded ! The Barrage wins the Europa League Championship! Island Trees just forfeited the Final game scheduled for today. We will not be fielding a team for the Pelini Tournament Aug 6 th and 7th because we dont have enought players. Anyone that wants to guest play for west islip...contact me .. Barrage wins Semi Final Cup game! Plays next League Game vs LI UNITED on Sunday. Great job today Barrage. Todays win vs LI United puts us in the Cup Finals July 23rd at 7 pm at the Medford Athletic complex at 7 pm. Barrage wins Quarterfinals of Marion Ring Cup! Moves on the the Semis! Great job ladies... 2-0 win vs Stony Brook Elite. This quarterfinal win moves us to the semi final game next saturday JULY 16th at 530 pm at Home (Moriches 1N turf). directions are on this site - under locations..
also.. since there is a camp at moriches the week of july 12th.. we will practice at smithtown east HS this tues and thursday! LIWSL Game one this sunday at 630pm! Take the Southern State Parkway to Wantagh Avenue North (Exit 28N toward Levittown). Make a left at first traffic light (Old Jerusalem Road). *The High School is immediately on your right. Enter the driveway before the High School building and proceed back to the parking area beyond the tennis courts and firehouse. Do not park in firehouse lot! Take Wantagh Avenue South from Hempstead Turnpike. After about 1.5 miles, make a right on Old Jerusalem Road (just past firehouse on right). Follow directions from * above. Please arrive at 530 for a warmup and to get uniforms to the new players. Bring a ball for warmup and wear all white socks and shorts -white jerseys if you have them from last season. I will bring the uniforms to the field for the new players. Bring 5 dollars each for the ref fee. NY Barrage Summer Season 2011 starts June 5th! Welcome to the 2011 NY Barrage Summer soccer season! 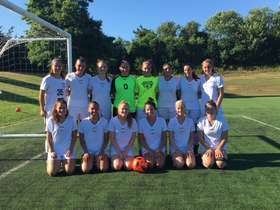 The NY Barrage Womens soccer team will again be fielding for the summer in the LIWSL. Practice Schedule is now posted...( see link - "practices"
League games are on Sundays at 6pm or later. I again will be offering 2 trainings (typical) per week (in the months of june and july )for those that want to get fit for college preseason , or for weekly games. These practices will be in Smithtown from 6-730 Tues and Thurs nites typically. Our website is updated but not complete , will post the complete 2011 schedule and directions asap. Barrage Wins Quarterfinal vs Levittown in PKs! 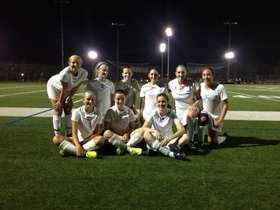 Great game last nite.. 2-2 in regulation, 0-0 in OT... 5-4 win in Penalty Kicks! Brandi...what can I say, your amazing! With 11 players on a hot turf field.. you all were fantastic.. Im very proud of every one of you! Next game is Sunday July 25th vs the #1 seed LI United away...at 6:15pm. WE NEED TO HAVE A GOOD SIZE ROSTER for this one! 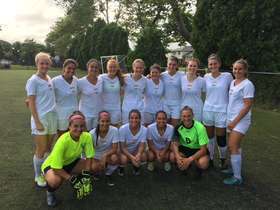 Practice this week is offered for wednesday at Smithtown East HS ( camp at moriches) and im looking to get enough players to field a scrimmage against LIJSL ODP U17 girls.. email me your avail.. this scrimmage would be held at LIJSL soccer park at 6:15 pm thursday july 8th. Great job Barrage. It was great to have numbers today vs Farmingdale. 3-2 win..
No game 4th of July weekend.. have fun..see you July 11th! Great game today Barrage! It was great to see you all today. Glad the weather held out.. See you all next Sunday ...League game sunday at 630pm. We have a first round cup bye saturday. NO GAME sat..just sunday at home at 630..
next cup game is saturday the 19th..
Summer 2010 Season Starts Sunday June 6th ! Hi NY Barrage'10! Our first season league game is Sunday June 6th at St Pauls School in Garden City. The game location was just changed on june 5th..
Game starts at 630 Sharp! We warm up at 530pm on the field. Those of you that have uniforms , bring both white and red shirts to the game. Those new to the team, wear white socks and white shorts, I will be bringing uniforms (hope they get here in time) or temporary tshirts for you to play in. Remember to bring 5-7 dollars each to pay the ref at the field each game. I will pick up your passes this week and work hard to get as much of your uniforms ready by the game time. The summer schedule is now on the LIWSL website http://www.liwomensoccer.com/schedule.php make sure you check this site tho because sometimes the game location or time may change last minute! I really need at least 15 at each game. Our Schedule is posted on this site. Games are usually 530 for sat games and 630 pm for Sunday games.. I will assume all of you are going to each game, reading this website and your emails/textmessages thruout the summer. I will assume all of you are attending every game unless you email or call me during the week. PLEASE be responsible to make every game you can. I still have youth teams finishing up tryouts and games the first two weeks of june. I will offer any of you to combine with my U17 team practice schedule on tues and thurs at 6-730pm at Moriches Turf. We will move to a fixed schedule dedicated to the NY Barrage shortly. Its time to sign up for NYBarrage Soccer 2010! Hope you all had a great year! Its time to decide if you want to be part of the NY Barrage in 2010! We again plan to field in the LIWSL and defend our Marion Ring Cup Championship! If you are planning to play with us this summer... you need to contact me asap. Registration for the summer has begun. All fees, passes etc must be complete by May 16th. I will again be offering two training sessions per week to those that want to prepare for pre-season college soccer or just to get game fit. Games are on Sundays for the League and the cup ( single elimination style) is on saturdays. Games are in June and July. If we have enough players around early August, we can enter the Pelini Tournament early August. Barrage wins LIWSL Cup Championship! Another great summer season by the NY Barrage! 1) NY Barrage wins first LIWSL Cup in Shootout! 3-3 regulation game, 0-0 OT, PK win! Not enough players to field in the Pelini Tournament. It was a pleasure to coach you all again! NY Barrage fields again Summer 2009! at 630pm Sunday June 7th! we still have open roster spots..
email me asap if you are interested to play with us. Another successful summer season concluded August 3rd. After 4 games of the Pelini tournament of 2008, the Barrage found itself in a three-way tie with Sachem and Levittown. A PK shoot out with sachem eliminated the Barrage from the final championship match. Although the Barrage did not repeat its 2007 Pelini Championship this summer, it did win its first 2008 LIWSL League Championship with an undefeated summer league season. I would like to thank you all for your efforts this summer. I feel very fortunate to be able to spend my summers with you all. I hope you all have healthy and successul college seasons and hope to see you all next summer! Please keep in touch with me during the year! 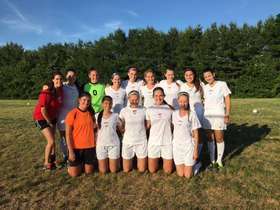 Barrage wins first place in Long Island Womens Soccer League! Congradulations Barrage, on your win last nite vs Sachem 2-0. Clearly, you all were on the same page last nite. Well played game. 10 players that wanted to win. I continue to be impressed with you all. Barrage ends up undefeated in league play for the summer of 08! See you saturday at the Pelini Tournament. Tonites championship game is cancelled due to rain..
we need to make this game up this week..
how do you all look for wednesday nite? Barrage wins SemiFinal of LIWSL with 10 players! Congradulations on winning the LIWSL semifinals last nite!
. Be at the field , wearing white at 445 ready to warm up. Another game short players.. well done getting the goal to tie sachem 1-1. Ladies..8 players ...of 25 for a game against the second best team in the league is not good. I was trying to set up a scrimmage between our players for this sunday but only a few of you responded to me. Practice will be tuesday and wednesday 22nd and 23rd at 6pm on our turf. Next weekend, we have two games SAT and SUN to determine the LEAGUE CHAMPION. Both games are scheduled for 530pm at this moment. Location is supposed to be at the higher seed... ( i think that means we will be home ..stay tuned). These games have been on the schedule, please make sure we have at least 16 players at every game from now on. Lastly, the PELINI tournament AUG 2,3rd... Only some of you have responded if you can make it or not. I expect all of you to email me so i can determine if we have enough players to enter this tournament. I will NOT send money to register us unless you respond. - preseason is only a few weeks away.. are you fit? we will be ramping up our training to help prepare you all.. Makeup game Wed July 16th at 6:45 pm at Sachem vs Sachem. BRING WHITE NIKE GAME JERSEYS and RED.. Arrive at 6pm to warm up. JULY 4th 2008 Weekly "Barrage"
We have a game this sunday at HOME ( on our Turf) at 630pm. Please arrive at 545pm ready to warm up. We need a good size roster..please out of 24 players..we need to have at least 15 at each game. I will again be away at a tournament , hopefully returning in time for the game. We do need passes for this game. My ODP season ends next weekend.. so i will be fully dedicated to the NY BARRAGE for the rest of the month and into early August. EMail me asap if you want to play in the AUG 2-3 Pelini Tournament ( the one we won last summer). this week we will practice at our turf field at 6pm with Coachjoe on wednesday June 25th and at 645 with Aisling on Friday . No Game SATURDAY! this second round cup game will have to be rescheduled ..Levittown is away in New England at a tournament this weekend. I will shoot for a weeknite.. say wed july 9th.. as a possibility. I was very happy to see the speed of play and your discipline to work crosses when requested. My last planned business trip is this week (Atlanta), so practice will be run by Kim and Ashling at our turf at 645pm wed and friday. Work hard.. i will be at the field on friday running a tryout for my U15's. I will join you at the end. Game one this sunday june 5th at 630 pm. LIE east to exit 62 Nicoles rd...exit and stay on service road past nicoles road exit..to light....make left on waverly ave.
after passing north service road..make right into waverly ave elementary school parking lot. fields are in the back. Wear white socks , white shorts, bring 5 dollars cash for the referee fee. Arrive 545pm ready to warm up. Ready for NY Barrage 2008! The Barrage has evolved into the NY Barrage.... a team of players from soccer towns across Long Island. For the summer of 2008 we are 24 players strong! Welcome additions from SUNY Oneonta, Molloy, Gettysburg, George Washington U and Marist will make us proud. Returning veterans from Oneonta, Providence, Towson, Mary Washington, Iona,Marshall,Stony Brook, Adelphi, Geneseo and Suffolk will no doubt impress all that come to our games. Our game and practice schedule is posted.. it may change..but at least we have some info..
Time to Register for Summer 2008 NY Barrage! Its time to sign up for your Summer 2008 summer season! 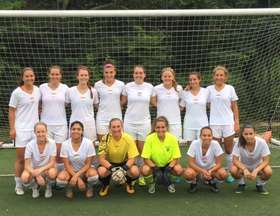 The NY Barrage had a very successful 2008 summer in the MSSL premier U23 womens league and it won the LI Open Womens LIWSL Championship! We again will be forming a competitive womens college team with the purpose of achieving fitness , skills and technical aspects of the game so that when each player goes to their college preseason, they are ready to play. I will again offer 2 training sessions per week for the months of June and July on our turf field in St James NY. This summer we will play locally in the LIWSL. We will also defend our LIWSL championship at the end of July. In light of gas prices going to 4 dollars a gallon, I have decided that we should try to play in a local league this summer. The Long Island Womens Soccer League would offer us weekly games on Long Island that typically play on Sundays at 630 pm. We would have home games as well. 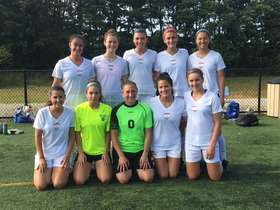 In the last two years we have played in the MSSL league , which is extremely competive ( all college age teams) but we had to travel to NJ , Ct and play two games on sundays. This did take up virtually all day on game weekends. I dont know all the teams in this league, some may not be as challenging as others but we always can arrange for scrimmages with outside teams if we need that level of competition. We wont know unless we try this league. In addition to weekly games we have the option to play in a single elimination cup competition that plays other local womens teams culminating in a championship. We also will register to defend our Long Island Championship August 2nd and 3rd. ARE YOU IN? Do you want to be fit this summer? Do you want to be ready for fall college tryouts? Do you want to have some fun playing on a great womens college team? Let me know if this is for you with a email asap! this is the info i have now.. dont think i missed anything else. not sure about ref fees yet. we can collect that at the field if necessary. fill out the US Soccer Registration and Waiver form posted on this website in the forms section. It is very important that I hear from you right away ..so i know who is definitely in, or out. I need to order uniforms for those of you that have not played with us before. We can also play in a single elimination tournament during the summer that plays on Saturdays.. Let me know if you have interest in this as well. So... lets get this going ! i can take more that 18 players on the roster...only 18 can go to any game. Looking forward to coaching you all this summer. Games are played on Long Island Sundays at 6:30 pm . Season opens June 8th and finals are the last weekend of July. Then our tournament is August 2nd and 3rd. MSSL Cup Weekend in Fort Dix July 22nd! We will conclude our formal MSSL League play this weekend at Fort Dix NJ in the MSSL cup tournament. Last season we finished 2nd with a loss in a overtime shootout. Only the best 6 teams qualified for this tournament weekend. We need all of you to attend. You must arrive 80 mins early.. they check Valid ID, Registration, Insurance ID card and Drivers Licence of all in the car. Bring this info with you!! Take Exit 7 (Bordentown) and exit onto Route 206 South. Make left onto Route 68 toward Fort Dix. Follow Route 68 and enter Fort Dix. At the first traffic light, make a right on to Fort Dix Road. Follow Fort Dix Road to the first traffic light and make a left onto Pointville Road. Go approximately 3 more miles on Pointville Road (past fenced military housing on the left). Take a left through the marked Fort Dix Special Event and Soccer Gate. Once through the gate, follow the signs to the fields which are at Doughboy Loop. The Barrage showed its determination to come back from behind and tie a tough Eastchester team during its first Summer 2007 Home game at Moriches Field today. Well done ladies.. great effort by all. We will practice wed and friday at 7pm this week on our turf field . I am running a tryout from 6-730 so please get together and warm up. ( Jog, ACL warmup, skill buildup) so we can start at 730. We will be playing on our home turf this sunday at moriches..! Right now , it looks like we only have one game at 1030am. This will be vs Eastchester since the monmonth coach just emailed me today (fri) to cancel. bring your completed forms to practice. From The South: Use the Taconic Parkway as the main road north. Exit at Route 55 towards Poughkeepsie and merge onto 55 West. Follow 55 to the next light and turn left onto Stringham Road. At the stop sign turn left then quickly right. The entrance to the park is on your left. From The North: Use the Taconic Parkway as the main road south. Exit right from the Taconic onto Todd Hill Road. This is the first exit south of Route 55. Proceed west on Todd Hill and make your first left onto Stringham Road. The entrance to the park is on your left. Be at the field at 9am. Our first game is against Yorktown Jaguars at 10am sharp. Our second season as a U23 College team began today June 10th. We were light in players but not in spirit. I was not surprised that we were not game fit. I was though very happy to see you work thru the difficulty on the field. We had numerous opportunities to score, yet we came up short. I am certain, that our fitness and success on the field will improve. See you all at practice wed and friday, 7pm moriches turf. Welcome Rachel Pardini, who joined our team today! Games begin this weekend! Barrage 2007 ! We play two games this sunday June 10th. Sunday at 330 and again at 5pm. Both games are at North Rocklands home field. Practice is friday june 8th at 7pm at our home field on moriches road. Bring your final registration info to practice..
Get ready for the fall college season! Time to register is now for the summer of 2007. We will be fielding again this summer for training and games. I am looking to have a 22 person roster so we can ensure we field at least 16 at each game. email me if you are in! bring a teammate/friend. seeking to stay sharp and fit, and display their skills, during Summer 2007. Participating Teams: Click for Mens and Womens Team Lists. on 5-6 of the listed dates, womens teams about 4-5 of the anticipated dates. Refs: MSSL expects to assign an experienced three-man system for each game. considerations, partly on competitive matchups. head-to-head games, then by goal differential. Rosters: Up to 30 players per team; 18 can be listed for any one game. same as the cutoff date for U23 National Cup competition. Sponsors: Being sought for Trophy Awards, and for possible playoff weekend. competition in this age group. We will train 2x per week and play games on the weekends. Training costs will be the same as last year as will be the referee fees. Those of you that did not play with the Barrage last year will need to buy a uniform. We have a formal ( all white nike top and shorts ) and a red Barrage logo tee shirt with number for our practice jersey and alt top. As we get closer to August tryouts, we will step up the fitness training to make sure we are prepared for college ball in the fall. MSSL Summer Season Concludes for 2006! Outstanding conclusion for a great summer season! The Barrage forced North Rockland to a shootout after forcing a 1-1 tie into overtime and into PK's. Our PK performance, well... we could have done better..but we have nothing to feel bad about. We played great.. and gave them a great game. I truly enjoyed the first summer MSSL season, and hope to see you all in Barrage Uniforms again next summer. We will roster the team again..and host at least 2-3 home games on our turf next year to reduce the amount of travel. Best of luck to all of you in College.. do well. Keep in touch. Our opening day of MSSL premier play was quite impressive. Its been quite a different fall for the Barrage this year.. Barrage wins LIJSL Division 1 Championship & Waldbaums crown !!!!! The Barrage repeats its Division Champion Status! We captured back to back GU17 D1 and GU19 D1 Championships. In our final LIJSL season, we have earned 21 points ..winning all but one game. This is an outstanding accomplishment. Many teams fall apart, loose interest, and fail to even field. Your talents and committment to this team is not to be underestimated. The merger of two outstanding Smithtown Kicker teams ..( Stikers and Barrage ) and the outstanding contributions of Allison, Megan, Theresa, and Lauren makes this team the strongest we have ever fielded. Coach Artie and I could never imagined that the combined talents of all of you would not only be successful on the field, but off the field as well. Talent is one thing..team chemistry is another. We have both. Not typical. First in LIJSL division 1. SemiFinalist in ENYYSA State Cup. A great statement to how it is supposed to be. It dosnt end... It only begins a new chapter. I hope you all remain friends forever and get together for alumni games regularly. Im truly proud to be your coach! Memorial Day at the Columbian Tournament 2005 !!! I am so proud of all of you and your efforts at the Columbian Tournament! Our SemiFinal round game vs Yorktown (0-1) was well played, exciting and impressive. The opposing coaches comment... "your team really wears their hearts on their sleaves" sums it up.. your efforts and abilities were noticed by all. I cherish every moment we have spent together... i will never forget this team and each of you. You continue to impress me with your insight to the game, your willingness to share your coaching observations and problem solving solutions. The halftime moment on sunday...convinces me you paid close attention all of these years to the coaching points you were shown. The best thing a teacher can ask...is that their students grow up and teach. Im certain you all will share what you have learned from youth sports with your children and community where ever you go. It was never really about soccer. Although we all love the game... Soccer was the conduit we used to learn the important things..
And above all, I hope we have burned in some great memories and long lasting friendships. Coach Artie and I are very proud to be your coaches. There are many people, particularly in sports who think that success and excellence are the same thing and they are not the same thing. Excellence is something that is lasting and dependable and largely within a persons control. In contrast, success is perishable and is often outside our control. If you strive for excellence, you will probably be successful eventually people who put excellence in first place have the patience to end up with success.
" a athletes world is physical; a competitors world is mental." are you thinking about this season? are you determined to win? are you prepared to compete? Excellent 2nd place finish at the Stony Brook indoor tournament! The Barrage continues to produce quality results. Your ability to learn...adapt, and win back to back semifinal games against a team that beat the stonybrook seawolves was impressive. excellent effort by all that were able to attend. 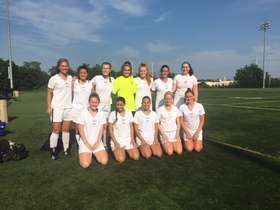 Barrage goes undefeated in Kirkwood College Soccer Showcase! 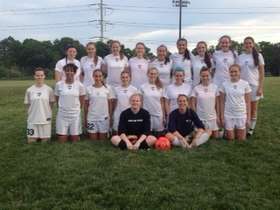 Congradulations ladies on an excellent showing at the Thanksgiving Kirkwood College Soccer Showcase! Barrage goes undefeated after 4 games in front of college coaches down in Delaware. Defense rules. We only allowed 1 goal against. I hope everyone enjoyed the experience. Special thanks to Mr and Mrs Rowe for all their help with the team brochure and hotel accomodations! Impossible is just a big word thrown around by small men who find it easier to live in a world they've been given than to explore the power they have to change it. i saw the above on the adidas website...i love it! what do you think as you enter your last semester in high school? Smithtown Varsity beats Northport in Semifinals! After being down 0-2 for over 60 mins... Smithtown Varsity ties game in last 10 mins of regulation to win in PKS!!!! County championship game is 8pm at center moriches hs saturday nite. Barrage / SGVST Seniors 2004 !!! Our 2004 HS seniors on SGVST.. Funny.. Abby Waumbach scored 5 goals in a game the other day..
After a scoreless first half.. She gets 4 assists from mia hamm..
USA - Abby Wambach (Mia Hamm) 47th minute. USA - Abby Wambach (Mia Hamm) 76. USA - Abby Wambach (Mia Hamm) 79. USA - Abby Wambach (Unassisted) 84. USA - Abby Wambach (Mia Hamm) 90.
she becomes one of only 4 women in history to score 5 goals. She gets her name in the paper yet mia assisted on 4 of 5 goals.. I say mia deserves some major credit. what do you think? Barrage...4 division championships in 7 years. Spring season 2004...we allow only four goals against! Winning is our habit...keep it up! Showcase tournaments in the fall ..Train in the winter. Premier in the spring. I would like to personally welcome our newest teammates Allison Rowe Lauren Rispoli, Megan Bundrick and Theresa Ennis. I am very excited to have you all on our team. We have a strong team, now only stronger with you! WOW!!!! We did it! We finished spring season division one...with only one loss... (no ties.. just us~ in first alone!) We allowed only 4 goals all season... 7 shutouts! How do you spell D-E-F-E-N-S-E! Congradulations Barrage on your first place finish this fall. While the competition wasn't true D1, you still did something amazing. In my memory...no U17 team ever fielded in the fall...let alone win it. Your determination to field..and play at the highest levels is greatly noticed and admired by many. You all SET the STANDARD, for many younger teams. Your efforts will be remembered for many years to come. To increase the amount of communication on the Barrage, we have formed three subTeams..
Each of the team captains will be responsible to keep you informed of practices, games, tournaments, etc. Each of you will be reponsible to communicate to them- concerns, complaints, attendance conflicts, etc. This will also provide a good phone chain for changes to our schedule or important announcements. Be sure to complete the phone chain..and to respond to your assigned captain any answers or actions requested of you asap. hope this helps make us EVEN better than we already are! The Barrage Friends and Family Charity effort has been a heartwarming success. We have been making beautiful American Flag Pins and selling them to raise money that will be 100% donated to help needy families affected by the Sept 11th Disaster. Sorry D and Stina..we will get a new pic soon! Barrage Takes Home The Gold !!!!!!!!! Wow! Congradulations Barrage on your outstanding first place finish at the Virginian Memorial Day Tournament! Outstanding effort by all. Amazing comeback finish! You never gave up! Unusually physical game. Short passing style of play by Smithtown, direct play by Crofton. The Barrage gets Physical! 50/50 balls are won. Fair..well maybe fair challeges are given throughout the pitch..Barrage fights back! Tempers escalate...Coachjoe nearly gets his first yellow card..(Luckily the ref dosnt understand English). With 5 mins remaining in the game. Christina Killourhy (our defensive middie) chips one in over the keepers head! With 15 seconds left...Kailee beats two Crofton Hotshots and buries the ball past the keeper to tie it up! Time runs out 5 seconds later! About 15 mins in...Croften gets a PK due to a inadvertant handball. Dianna lays out to save it!!!! Jen, Kailee, Audra, Christina S score! Dianna Saves two normally unsaveable goals! We would love to hear what you think about the site, if you have any queations or comments we love to hear from you. Remember To Call Coach Joe If There Are Any Games On TV! The dictionary meaning is "The continuous bombardment of artillery on a specific location". We changed it to "The continued shooting of soccer balls into the other teams goal! Barrage will field again for Summer 2007! The Barrage lives on! After a terrific summer last year (2006), the Barrage plans to field again for the Summer of 2007! We will be playing in the MAPS league again..this time we hope to host 2-3 weekends of games. If you are a serious college player, looking to train 2x per week and play at the highest college level... email me at coachjoe@optonline.net. We will be taking 18 players max to each game. Roster size expected will be 22-24. This week we will practice on our turf field at 7pm on Wed and Thursday July 11 and 12th. At this time , we still do not have an opponent for sunday. seems the nj teams dont want to drive to Long Island. I will have more info at practice. We will be playing in the MSSL cup the next weekend.. july 22nd at fort dix. PLEASE arrange rides for this culmination of the MSSL league play. Last year we lost in the finals in a PK shoot out. I would like to play the empire team the weekend after or possibly during the week. Training will be back to wed and fri till august. The 2010 Barrage season concludes with a 3-1 loss to the LI United. Thank you all for playing this summer! I really enjoyed coaching you all again. Please keep in touch with me thru the year! We need to get better attendance at our games. We have 17 rostered players, yet we had 9 at this weeks game. If we all showed up, we would have won this game. This week i have tryouts for my youth team. Kailee will run the practice on thursday at 7pm at Plot. No tuesday practice June 18th. Just thursday. we will be back to two per week the week of the 24th. The Premier Divisional playoffs start next Sunday July 7th.. It would be great if we can get 15 minimum players to attend. Our league play is over now. Playoffs for the Premier Division are single elimination. Teams that loose in Premier playoff games slide to the Europa Playoff schedule so we continue to play thru July. OUR next Game is at the MEDFORD Athletic Complex on JULY 7th at 7 pm. We play the 4th seed Molloy College team . If / when we win that , we advance to the QuarterFinals of the Champions League on July 14th. If we lose, we play in the semi finals of the Europa League on July 14th. Practice will be Tuesday at 7pm at Stony Brook Plot. 145 visitors have signed our guestbook.